HOUSTON -- Rocks on Mars dug from far underground by crater-blasting impacts are providing glimpses of one possible way Mars' atmosphere has become much less dense than it used to be. These are not the first detections of carbonates on Mars. However, compared to earlier findings, they bear closer resemblance to what some scientists have theorized for decades about the whereabouts of Mars' "missing" carbon. If deeply buried carbonate layers are found to be widespread, they would help answer questions about the disappearance of most of ancient Mars' atmosphere, which is deduced to have been thick and mostly carbon dioxide. The carbon that goes into formation of carbonate minerals can come from atmospheric carbon dioxide. "We're looking at a pretty lucky location in terms of exposing something that was deep beneath the surface," said planetary scientist James Wray of Cornell University, Ithaca, N.Y., who reported the latest carbonate findings today at the Lunar and Planetary Science Conference near Houston. Huygens crater, a basin 467 kilometers (290 miles) in diameter in the southern highlands of Mars, had already hoisted material from far underground, and then the rim of Huygens, containing the lifted material, was drilled into by a smaller, unnamed cratering event. Observations in the high-resolution mode of the Compact Reconnaissance Imaging Spectrometer for Mars (CRISM) instrument on the Mars Reconnaissance Orbiter show spectral characteristics of calcium or iron carbonate at this site. Detections of clay minerals in lower-resolution mapping mode by CRISM had prompted closer examination with the spectrometer, and the carbonates are found near the clay minerals. Both types of minerals typically form in wet environments. The occurrence of this type of carbonate in association with the largest impact features suggests that it was buried by a few kilometers (or miles) of younger rocks, possibly including volcanic flows and fragmented material ejected from other, nearby impacts. These findings reinforce a report by other researchers five months ago identifying the same types of carbonate and clay minerals from CRISM observation of a site about 1,000 kilometers (600 miles) away. 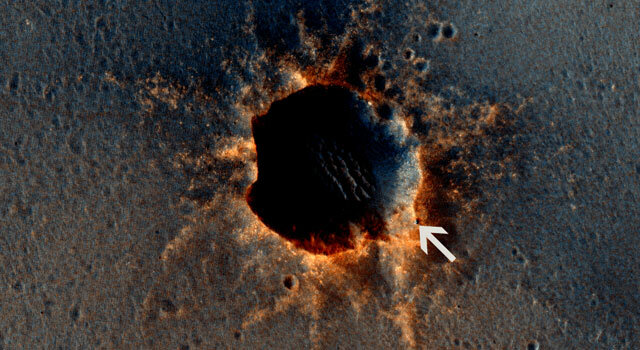 At that site, a meteor impact has exposed rocks from deep underground, inside Leighton crater. In their report of that discovery, Joseph Michalski of the Planetary Science Institute, Tucson, Ariz., and Paul Niles of NASA Johnson Space Center, Houston, proposed that the carbonates at Leighton "might be only a small part of a much more extensive ancient sedimentary record that has been buried by volcanic resurfacing and impact ejecta." 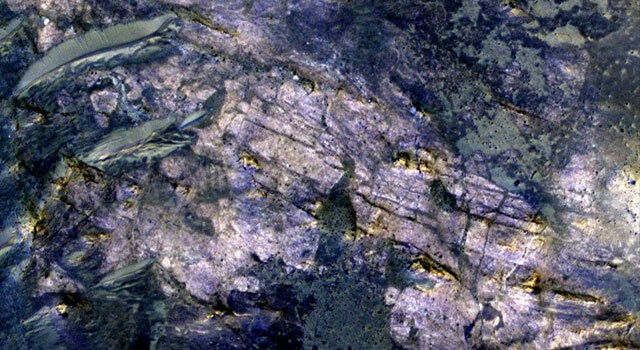 Carbonates found in rocks elsewhere on Mars, from orbit and by NASA's Spirit rover, are rich in magnesium. Those could form from reaction of volcanic deposits with moisture, Wray said. "The broader compositional range we're seeing that includes iron-rich and calcium-rich carbonates couldn't form as easily from just a little bit of water reacting with igneous rocks. Calcium carbonate is what you typically find on Earth's ocean and lake floors." 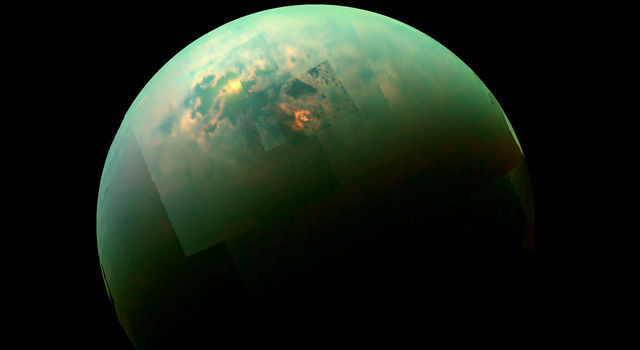 He said the carbonates at Huygens and Leighton "fit what would be expected from atmospheric carbon dioxide interacting with ancient bodies of water on Mars." 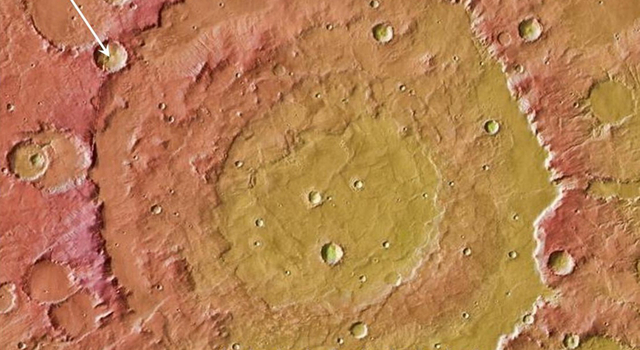 Key additional evidence would be to find similar deposits in other regions of Mars. A hunting guide for that search is the CRISM low-resolution mapping, which has covered about three-fourths of the planet and revealed clay-mineral deposits at thousands of locations. "A dramatic change in atmospheric density remains one of the most intriguing possibilities about early Mars," said Mars Reconnaissance Orbiter Project Scientist Richard Zurek, of NASA's Jet Propulsion Laboratory, Pasadena, Calif. "Increasing evidence for liquid water on the surface of ancient Mars for extended periods continues to suggest that the atmosphere used to be much thicker." Carbon dioxide makes up nearly all of today's Martian air and likely was most of a thicker early atmosphere, too. 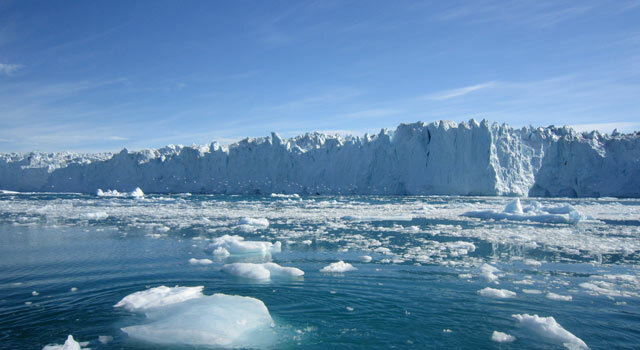 In today's thin, cold atmosphere, liquid water quickly freezes or boils away. What became of that carbon dioxide? NASA will launch the Mars Atmosphere and Volatile Evolution Mission (MAVEN) in 2013 to investigate processes that could have stripped the gas from the top of the atmosphere into interplanetary space. Meanwhile, CRISM and other instruments now in orbit continue to look for evidence that some of the carbon dioxide in that ancient atmosphere was removed, in the presence of liquid water, by formation of carbonate minerals now buried far beneath the present surface. The Johns Hopkins University Applied Physics Laboratory, Laurel, Md., provided and operates CRISM, one of six instruments on the Mars Reconnaissance Orbiter. 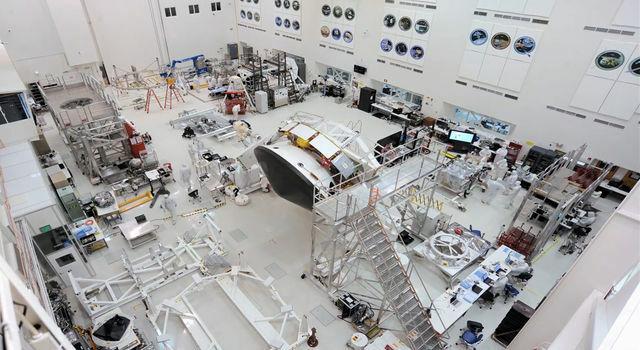 JPL, a division of the California Institute of Technology in Pasadena, manages the Mars Reconnaissance Orbiter project and the Mars Exploration Program for the NASA Science Mission Directorate, Washington. For more about CRISM, see http://crism.jhuapl.edu . For more about the Mars Reconnaissance Orbiter, visit http://www.nasa.gov/mro .